This week I am focusing on how easy and inexpensive it is to make your own pie crust Today I am sharing my grandmothers recipe for making pie crust. 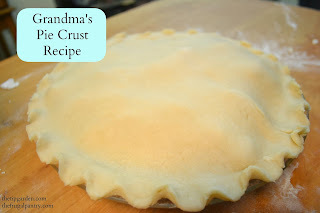 If you have been one of those people who buy the premade frozen crusts from the store either in the shell or the unroll it and use your own pan style, I promise the taste does not compare to making your own! It doesn't take but 5 minutes or so to make your own, and no more flimsy thin crusts ! In mixing bowl, add flour, salt, sugar, baking powder and shortening. Mix on low till crumbly. Dump all the dough onto a lightly floured surface. Knead the dough together approximately 5-8 times till the ball is well blended together and smooth. Dough is now ready to roll out. Divide dough in half. Set one half aside. Roll the remaining half into a ball. Flatten the ball slightly with your hand or rolling pin. Using a lightly floured rolling pin, roll out your pie crust to slightly larger than your pie pan. Place folded dough into a pie pan with point of dough in the center of pan. unfold dough till it covers and drapes over the sides of the pan. Press down gently on pie crust to fit snugly into bottom and up sides of pan. If baking as a single crust shell, prick bottom and sides of crust with a fork. Roll out second half of pie dough as you did above. Place tip of triangle over center of pie filling. un fold triangle of dough to cover pie filling. Trim off the excess pie crust from both crusts by running knife along the edge of the pie pan. gently press the top and bottom crust together along the edges of the pan. Crimp with fingers or the tines of a fork the edges together. Roll out the scraps of the pie dough and with a knife, free hand a leaf shape. Gently place the leaves around the center vent hole of the top crust. Bake pie according to pie filling recipe. Mine was a thawed apple filling so baked it at 375° for about 45 minutes. Great question! Although I've never tried it, my understanding is that it can be done. It may not come out as "flaky" but it will turn out just fine. It's not an even swap as far as quantity goes. Start with 3/4 cup and then add the add'l 1/4 cup called for (1 cup shortening) if you need it. Since it has a lower temperature for melting than shortening, if you make it on a hot day in a hot kitchen you may want to "chill " the dough after mixing it if your are going to roll it out and bake with it right away. Good look and let me know how it turns out if you try it! Ok, you are now my new favorite! :) I actually was a little embarrassed about the edges, that they weren't magazine perfect! I hope you like the recipe, I know it's hard to find that perfect one! Let me know how it turns out for you!